Join local artist Bernadette Fischer for her Intro to Brush Calligraphy Workshop and learn the basic skills and principles of calligraphy and brush lettering. 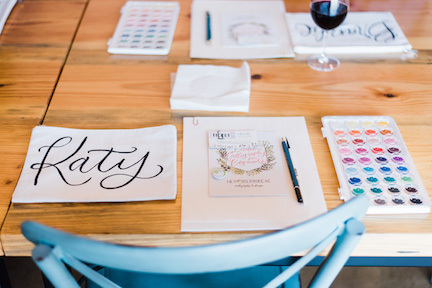 With the knowledge you'll gain - and practice, of course - you'll be able to letter personal projects for your home, create meaningful gifts for friends and family, address envelopes beautifully, and even begin a new business of your own! Bernadette's classes are for beginners, so if you've never tried calligraphy or brush lettering you're perfectly welcome to start here! You'll learn what makes calligraphy calligraphy, the basics of forming and joining script letters, the tricks that will take your lettering to the next levels, how to get the best from and care for your brush lettering materials, troubleshooting & how to avoid common beginner mistakes, the basics of watercolor as a medium, and of course Bernadette will be there to guide you and answer your questions. Cost: Basic registration for members is $80, nonmembers is $85, and includes borrowing all class supplies from Bernadette. If students would like to have supplies to keep and continue to practice, Bernadette can provide their supplies in a kit for $20 each if they are purchased at time of registration. Detailed photo of kit is below.